A wedding is the one time a young girl truly gets to look and feel like a princess. The dress, flowers, makeup, hairdo and attention is the magic little girls dream of. And they can often eclipse the bride with their adorable, unabashed cuteness or "rain on the parade" of festivities with brazen disregard. The smart bride knows that like the rest of the bridal party, when the younger attendants are chosen wisely its like the finishing touch on the wedding cake. When it comes to the makeup and hairstyling for the young Misses its best to keep it age appropriate. And what does that mean? Keeping it youthful and fresh by camouflaging where needed, accenting where suitable and balancing where required. OK, some details. Lipstick on a flower girl goes overboard, but a very little touch of gloss and sweeping hint of a light pink or peach (depending on the theme colour tone of the bridal party) over the cheeks can make the little princess feel like she's about to step into glass slippers. 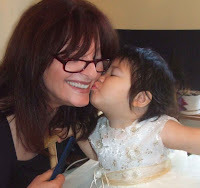 And this makeup maven carries a magic wand with her and pretends to sweep eyeshadow and shimmer all with the magic of wand and voila - its the "Empress's New Clothes" approach to the little one's makeup. Its the attention they love. So hold back on the actual makeup and use pretend magic instead. Once again its an age appropriate or common sense approach to makeup and hairstyling. Fresh, natural and minimalist always works best. Never use black mascara on Caucasian skin or liquid liner. Instead, opt for a med dark brown powdered liner and brown mascara, unless its black skin and then, of course, a very dark brown works best here. And again lipstick or stain on the subtle side is the best call topped with a gloss - or hey, just the gloss is often best. At this age blemishes can often be problematic so a good foundation used sparingly and only to cover needed areas topped off with a finishing powder helps to camouflage eruptions and even out skin tone. I prefer MAC Face & Body Foundation - its my current fave for all ages. The classic half up, half down style for junior miss always works well. And if ever ringlets were suited to an age range, this is the one. Ringlets can be made simply with rags or sponge rollers put in the night before with clean, slightly damp hair and a little hairspray to help hold the set. Otherwise hot rollers on the day with a little hairspray just before putting them in the hair too. Tip: The thinner the hair, the less product should be used - a flexible hold hairspray is best (I prefer Dove). Tip: The smaller the roller, the tighter the ringlet. 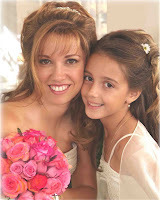 Flower Girls often have thin, wispy hair. 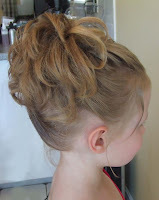 In this instance hair put up in a pony tail high on the crown with ringlets or curls that are allowed to bounce can be very cute and keep the hair out of the way of the little tyke and eliminate hair grooming throughout the day. You can also do little pony tails all over the head or the traditional one on each side - there are endless ideas to choose from. What matters is what suits the young girl's face and hair type. 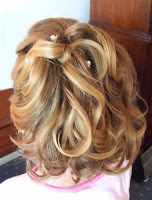 Juniors usually have thicker, longer hair and the same curling approach works here too. There are numerous styles to choose from, but once again, best to keep it age appropriate. Often vintage looks are attractive, fun and appropriate (can be achieved with a crimping iron). Tip: Best to work with the natural curl or straightness of the hair type - its easier and requires less grooming and avoids frustration. Everything from head bands, to flowers, to halo rings, to ribbons, tiara, etc. can be a failure or fab. Balance and portion are key. Tip: Make sure head bands or tiaras have a flexible wire base to mold to the head. Tip: Avoid silver covered bobby pins with decorative gems - they are too stiff for most hair and are hard to secure in a soft natural way. Tip: Silk flowers are much lighter, won't wilt and easier to fasten than real flowers. Incorporating these tips, planning ahead and utilizing the services of a skilled artist will make for a fun experience on the day and give the added assurance you made the best decisions in the makeup and hair design so you can enjoy pictures and videos for years. Preferred by the celebrity and business elite Sharon is a Master Artist renowned for her modern elegant yet ageless designs. She is a respected leader in creating exotic transformations for the full ethnic range and distinctive looks - and always incorporates your personal style preferences.